WASHINGTON (Reuters) - Citizenship for "Dreamer" immigrants will not be on the table as lawmakers try to negotiate a compromise on border security to keep federal agencies open beyond Feb. 15, the No. 2 Democrat in the U.S. House of Representatives said on Tuesday. "I don't expect that to be part of the negotiation," Hoyer told reporters. He added that he expected to bring a separate bill to the floor in the "near future" on the Obama-era Deferred Action for Childhood Arrivals (DACA) program that currently protects from deportation the "Dreamers," immigrants brought illegally to the United States as children. The chairman of the House Democratic caucus, Hakeem Jeffries, told reporters that Democrats do not support a border wall "from sea to shining sea," but said some physical border barriers may be acceptable. "We are willing to support fencing where it makes sense, but it should be done in an evidence-based fashion," Jeffries said. He noted that Democrats have supported some border fencing in the past. "I'm certainly open to it," McConnell said. Democratic Senate leader Chuck Schumer urged Trump on Tuesday to step back from negotiations and "let Congress do its job." "When the president stays out of the negotiations, we almost always succeed," Schumer told reporters. 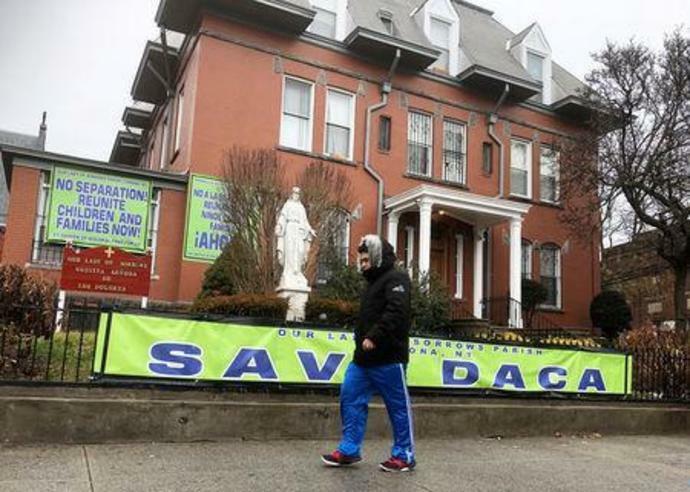 Democrats have long sought legislation to end the threat of deportation for "Dreamers."